Given the craziness of last night, I didn’t get out of bed until noon the next day. Skipping breakfast, I decided to jump right into the day. My first order of business was finding a computer so I could blog about the day. I first went to the mall, but the internet place didn’t open until 1pm. Not wanting to wait, I walked around and found a second place but it was running Windows 95 (actually) so I couldn’t load any webpages. The third place I tried was the State Library. The library was also closed because it was a state holiday. It turned out that Bonalu is a multi-day festival starting with 4 Sundays followed by the grand finale on the next Monday. This was the Monday. As a result, almost all the Hindu run-shops were closed and Hindu temples and random people would set up speakers and blast Hindu music to rock concert levels. The noise hurt the ears of everyone who walked by. I then walked 4km towards the Old City before getting lunch at a kebab place. Unlike the Hindus who dressed colorfully, the Muslims dressed plain. The men wore a plain white outfit with a tan hat, while the women wore the black full veils with just their eyes visible. Despite the dress, the people were generally not actually all that religious. Even though it was the month of Ramadan, the restaurants were all packed with Muslim couples and families. During the prayer calls from the mosques the people did not pray and kept shopping. Actually, many of the veiled women wore sandals with fancy bangles on their ankles. I got the feeling that the conservative dress was more a way for the community to differentiate itself from the Hindus rather than a display of piety. 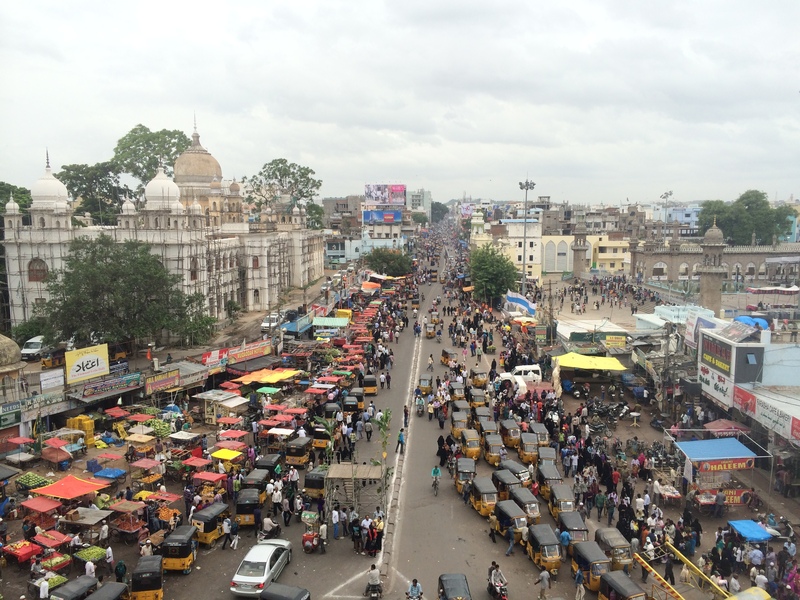 The Muslim community in Hyderabad, India’s largest, was very strong and common dress was a way to identify fellow community members and create group solidarity. For example, dressing differently from Hindus would create protection against abuse from the Hindu police force since fellow Muslim will be able to see the situation and help their own. After lunch, I made my way to the Charminar, the symbol of Hyderabad. It is a large four-pillared monument with a mosque at the top. The observation deck is below the mosque and is accessible by a dangerously crowded narrow spiral staircase. The admission price was 10 rupees for an Indian national but 200 for a foreigner. While 200 rupees ($3.30) wasn’t all that much to enter such an amazing structure, I did not like being charged 20 times the price as an Indian. Most of the people visiting were not poor; rather they were mostly families taking a vacation to Hyderabad and could easily could afford 200 rupees/person. The major price differences between Indians and Foreigners occured everywhere. While I was enjoying the view at the top, there was suddenly a loud whistle from a cop that signaled everyone to leave the monument because of the festival. With the Charminar now closed, I wandered the nearby streets of the centuries old Laad Bazaar. The narrow alleyways were packed with people buying jewelry, bangles, women’s fabrics and some handicrafts. Lots of tailors asked to make me suits for cheap. The sheer number of people shopping here was astounding. Next to the bazaar is the Chowmahalla Palace. 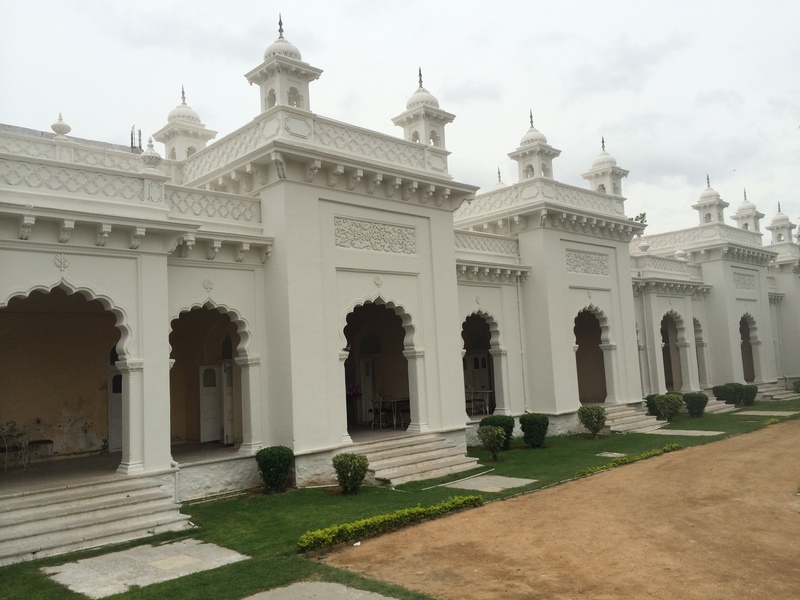 Literally meaning “Five Palaces”, Chowmahalla was the home of the Nizam, the Mughal ruler of Hyderabad. The rule of the nizam officially ended when India became independent in 1947; however, there the Nizam and a royal family that wielded considerable influence in town. The palace was constructed to be a replica of the Shah of Iran’s palace, as the Nizams claim Persian ancestry. It was by far the best-preserved site I have seen in India. The grass was mowed and there were security guards everywhere. The main building contained the throne room as well as the Nizam’s impressive furniture collection. Another held rare Quarans dating back over 500 years and a third building had the Nizam’s car collection which included a gold Rolls Royce that a past Nizam used as a trash can. The highlight of the palace was the “old time” picture booth at the end. 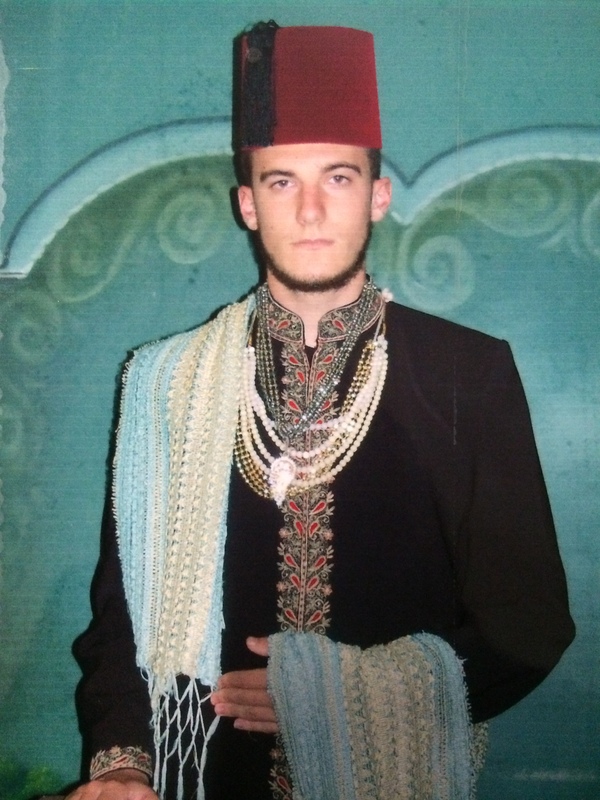 For just 100 rupees ($1.60), an attendant took a picture of me in clothes owned by the Nizam. The result was spectacular. When I left the palace at 5pm, it was time for the festival to start. Bonalu was the first major festival to take place since the founding of Telangana 6 weeks prior, the government decided to make it the official state festival. 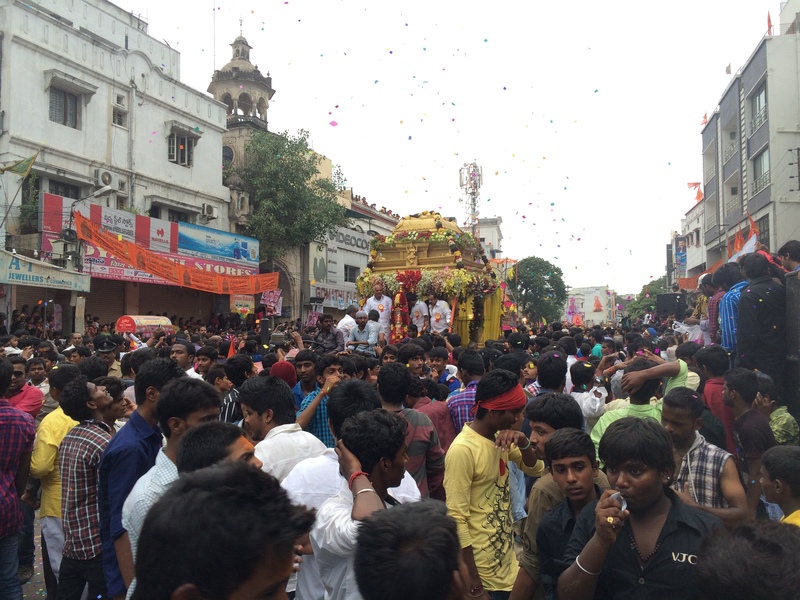 Therefore, the festival was moved to the main street in town, extending from the Charminar to a Hindu temple 5km south. This meant that the Hindu festival will occur smack dab in the middle of the Muslim area during Ramadan. To avoid any religious clashes, the government enlisted hundreds of police officers to make it a safe event for everyone. They also managed to completely close off the main road to autos and motorbikes. The parade started off with orange painted half-naked men running through the streets while dancing and whipping kids with large ropes. Each time a man ran by (there were at least 15), dozens of kids taunted him as they dodged his attacks. When he approached me, the lone foreigner, he posed for a photo rather than whip me. This festival was considerably larger than on Sunday and as a result there were far more curious people who wanted to meet me. The kids would run up to me, shake my hand, ask me my country, and then ask to take a picture. The kids today were more aggressive and would often drag me away from other people in order to get their picture. I had no bodyguard today so there was nothing to stop them. I never fought them and found that once they took their picture, they would leave me alone. About 30 minutes after the orange dancers, the parade started to move down the street. It started with a large elephant painted and adorned in jewels. 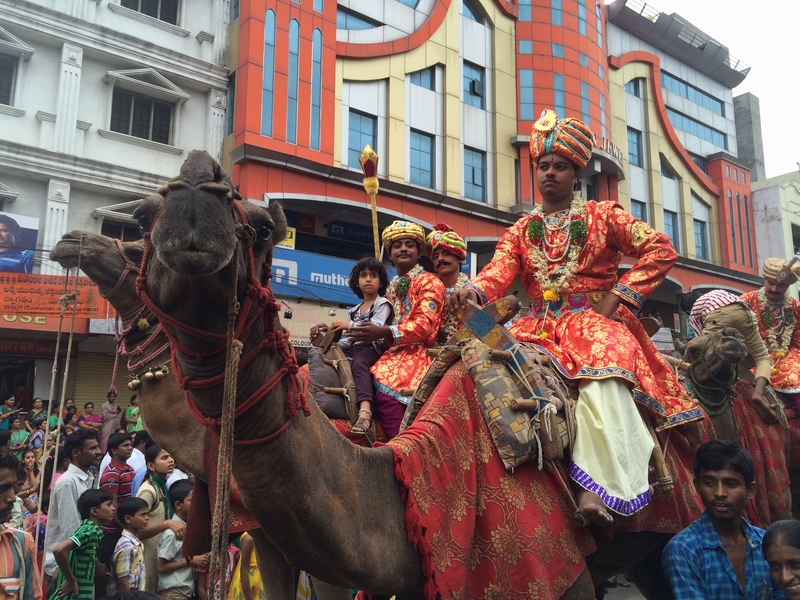 There were also camels, horse riders, chariots pulling someone dressed up like Vishnu, Shiva dancers, trucks pulling boom boxes, large carts carrying Hindu god statues, and much much more. The parade moved down the street very slowly since hoards of people walked into the middle of the parade to get pictures of everything. It was utter chaos. My favorite part of the parade was all the Muslims watching the parade. They looked so confused by everything that was going on in their neighborhood. Occasionally, I would walk by a Muslim man and kind of scratch my head at the spectacle. He would usually put their arms up in an “I don’t know” gesture and then laugh. 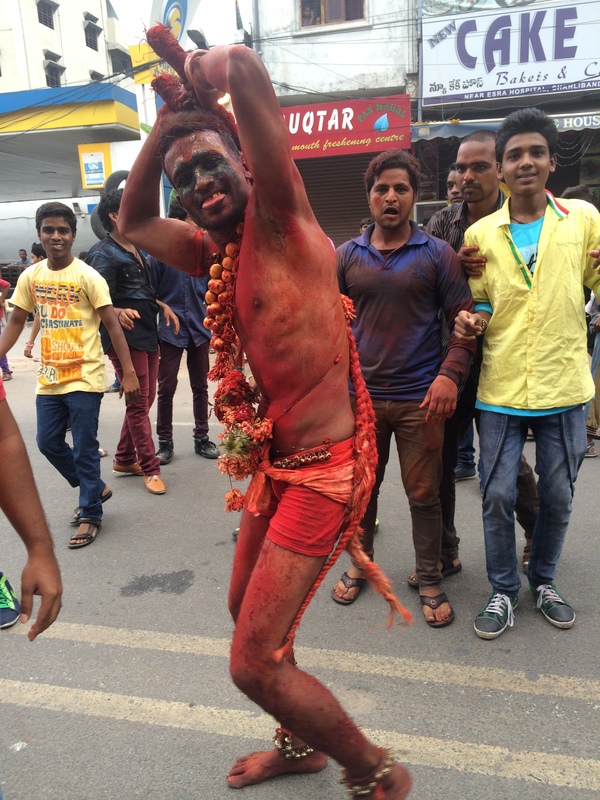 Even though the city was not entirely Hindu, the whole city was certainly entertained by the Bonalu festival. I decided to walk toward the start of the parade and eventually ran into a large dance party in the middle of the street. As per usual, I was approached by a group of kids. Instead of asking to take a photo of me, this time they asked to dance with me. Deciding that this was my moment to shine, I said yes and headed into the madness. 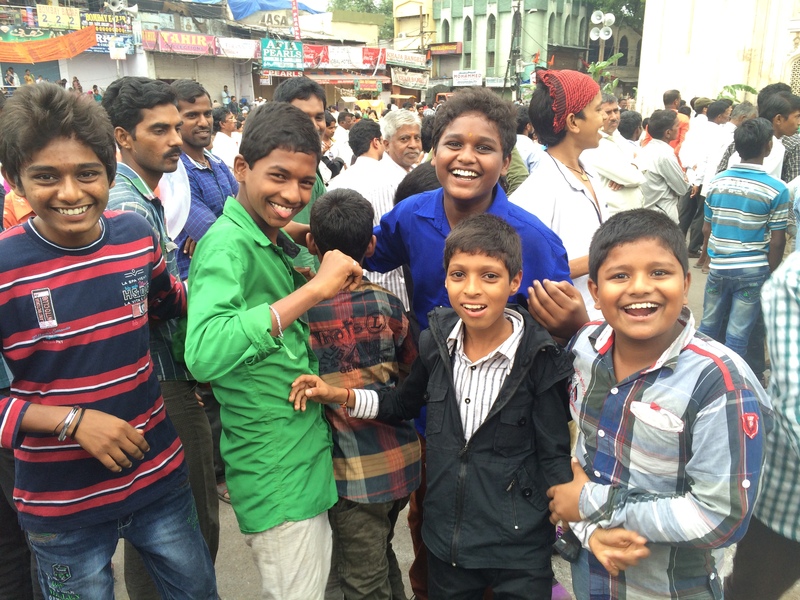 As I danced to the rowdy Indian songs, the people around me started cheering. Knowing I couldn’t go wrong, I decided to pull out my Bar Mitzvah dance moves and go crazy. I had a dance battle with some guy around my age and won- (as the white person, I had no chance of losing but still it felt pretty awesome to have won a dance battle since it has been on my bucket list for some time). The strange thing about all the dancing was that it was only men- all the women stood and watched from the side of the street. The kids who invited me to dance decided to show me around the parade and acted as my bodyguards. They bought me dinner (Ramadan haleem) and took me to the Hindu temple at the far end of the festival. Eventually, it was getting late so I decided to walk back. 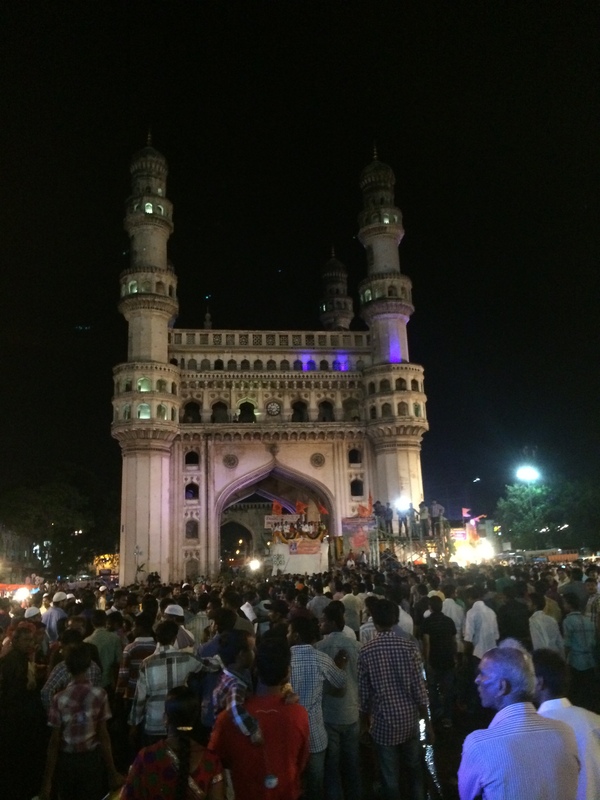 As I passed the Charminar, there was another huge dance party centered around a large stage. Here, there were about a thousand people dancing/watching. The kids asked me to go on stage to dance. At first I resisted but then decided that this was my moment (again), so I let them to drag me through the crowd and up onto the stage (there were other people dancing on stage, but I was front and center). The crowd here was crazy and captivated by my every movement. I started things off by clapping and the entire crowd clapped with me. I then busted out some more of my Bar Mitzvah dance moves as the crowd roared. After two Hindu songs, the DJ then played Gagnam Style. Luckily I knew the dance, so the crowd response continued to be fantastic. After the song ended, I was ready to head home a rock star. From the stage, I jogged to avoid talking to more people and an hour later, made it back to the hotel. While I didn’t officially record figures, I must have shook hands with and took pictures with at least 500 people today. After 2 amazing hectic days in Hyderabad, I was ready for something a bit more mellow. A few more days like this and you could beat the Congress party candidate for Prime Minister! Wish you had a video of those Bar Mitzvah Moves.